- Updated phpPgAdmin to version 5.1. - Removed Web Station check. and after update DSM you may reinstall and reboot. Needless to say I've tried the above method and it does not work. Not only does it not work but it also messes up PhotoStation too. I just install your package on my DS415+, with DSM 6, and I have "404 error" when I click on software. I try to modify files in comments (like /usr/syno/synoman/phpsrc/phpPgAdmin/conf/config.inc.php) but I think links are changed. Furthermore, I think the real problem comes from no links between "web station" and phppgadmin (like a link between /web/phppgadmin and the directory or creating a virtualhost - but I don't find your install directory). In addition I installed Photo Station and then it worked. I just follow the procedure you suggest (even 3 times to be sure I did not make any mistake, I still cannot connect. Thanks Yiannis! Just wrote your instruction down, so it's fast. 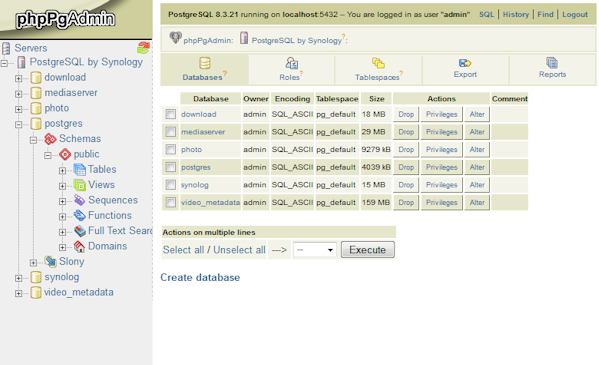 I have manage to modify PhpPgAdmin in order to work on DSM-6 and with nginx (replaced apache on newer DSM versions). Some people using "Web Station" to make PhpPgAdmin work. I think that a native way is more preferable. Any chance you can post some steps on how you accomplished it? I'm sure myself and a few others would really appreciate it. Delete and re-install the app. With the new DSM 6.0 you can no longer access telnet with the username:root listed in the below steps. This is due to the DSM 6.0 recent update "Root account is replaced by administrators group credentials to log into SSH to enhance security." You will now need to telnet with your admin username and password. If you wish to use root you can always log in using your admin username and password and use "sudo su -" followed by the admin password once again. This will put you back under the root user. I presume this recent update is causing some issues with this package. I have been running phpPgAdmin for months with no issues. I upgraded to DSM 6.0-7321 last night on my DS1513+. Since the upgrade last night I now seem to be getting a 404 page cannot be found error when trying to access the phpPgAdmin page from localhost. I am also unable to connect to any of the databases from clients. Reinstalled both Init 3rdparty and phpPgAdmin with the latest versions. Followed both the instructions from enzolino and Can using Telnet. I have also checked the pg_hba.conf file to ensure that localhost was trusted. I feel like a beaten man! Has anyone got this working on DSM6.0 and if another can assist it would be appreciated. I installed it on my Synology with DSM 5.1-5022. Everything works fine. I can now see the entries for audio-station, video-station,... GREAT! I have installed this aplication but i can not log in! I have used admin credentials bit no chance! Same problem here... do you finally realise how to solve it? Everything works fine on my 412+. The username/password are your DS admin credentials. I was able to install the package fine on 412 running DSM 5.1 - I can view the page /ip/phpPgAdmin/ but I cannot figure out the username and password? Is their configuration that isn't obviously mentioned? Most of the information I can find online seems to be from 2008 and none of it seems to help me. I could really use some help. Thanks!